Allergies Ruining Your Beauty Routine? Allergies are a pain. Quite literally sometimes. I don't typically get allergies in the spring, but look out in the fall. My eyes get intensely itchy. I get a sore throat. I cought and sneeze and feel utterly miserable. Luckily I disovered Zyrtec! Zyrtec relieves all my allergy symptoms and helps me to feel like myself and not like my head is going to fall off or explode at any second from all the pressure. It's hard enough dealing with a toddler all day, but when you're trying to see them through blurry eyes, it's even tougher! But what can you do about Allergy Face? What is allergy face, you ask? Allergy face is the result of allergies. Red eyes. Raw nose. Exhuasted eyes. While relieveing your allergy symptoms with Zyrtec will help with some of that, using a good coverup on reddened areas and eyes drops will help you get back to your beautiful self! Check out this video by Zyrtec to get great tips to help alleviate Allergy Face! Now that you have all the tips in place to make allergy season a little more tolerable, Check out Zyrtec on Facebook to get more tips to alleviate allergy symptoms throughtout the year! Leave a comment below and share your best beauty secret for fighting allergy face! Great post. I have allergies also so this was very informative! I have the worst allergy face..thanks for the tips! Good advice! Thanks so much for the tip on how long to keep mascara. I’ve never suffered from allergies, but one of my college besties had them so severely that she truly did look like she was on death’s door when they were acting up! One time I popped into her dorm room on a particularly bad pollen day, and she hadn’t put her makeup on yet. I was so startled by her appearance that I asked her if she needed me to call an ambulance! It REALLY would have helped her to get some serious allergy relief! This is great infographic. I have been suffering from allergies horribly lately. I have heard so many great things about Zyrtec. Luckily no allergies here but my husband and son have them. I’m kind of guilty for keeping some of my makeup longer than I should! Thanks for sharing about Zyrtec. We suffer from seasonal allergies so this would come in handy! Our youngest gets sick all winter long (on and off). The pediatrician said he has Winter Allergies. I’ve never heard of such a thing but I feel so bad for him!! If that’s what allergies do to you, yeeee-uck! Good tip on the make-up , for everyone! Awesome video. Professionally done. My eyes are always puffy (not necessarily from allergies) I’m going to try your aloe tip. Sunglasses are my go-to disguise since my itchy, watery eyes look horrible. Haven’t found a good remedy for my red nose though. Good tips. I recently started suffering from allergies as an adult and after trying many different medications, Zyrtec was the only thing that worked for me! Great tips, I like the sunglasses! I don’t have enough allergy issues to take anything for it but my husband is a mess when the wind kicks up. We use Zyrtec for him for sure! LOL, I love the ways to hide an allergy face.. Sunglasses are my tell-all! These are great tips for all of us who suffer from allergies! Allergies are the worst. Every spring all I want to do is open all the windows but I can’t becuase of my seasonal allergies (my husband has them too). Thanks for the tips! My husband swears by Zyrtec over the competition. great tips for those with allergies. My husband suffers from allergies from time to time, we really don’t know everything that triggers it. I will suggest Zyrtec! I’m fortunate to not have allergies, but one of my closest friends gets them so bad, she has shots every week! Interesting post. I haven’t tried Zyrtec yet and besides I don’t really have allergy. However, glad to know about this great tip. Anyway, I don't do makeup or have a beauty routine. I also don't have a problem with allergy face but allergy nose is an issue 😛 I itch it till it's sore then I feel like I have dragon scales for days… and I poke at it 'cause I honestly can't leave anything alone. Zyrtec is a favorite in our household. It not only does wonders for me, but for our whole seasonal allergy having clan. I always recommend Zyrtec and after this post and through usage I will continue to do so. Thank you for a great post. That’s why I don’t call myself a beauty blogger because I’m not the type of girl who wear make up all the time. I got sensitive skin. Anyway, great video! I am the unwilling recipient of the gene marker for allergies, inheriting them from my mom. I lost a lot of school days when I was a kid. I usually wake up with eyes swollen shut. I eventually outgrew my allergies, but now, my sons are manifesting allergies too. Zyrtec helped a lot, and my boys are up and about after taking it. They are back to playing their favorite sport – basketball, without the itchy, watery eyes. Perfect for making that 3-point shot! Great information. I suffer with allergies and have been dealing with allergy face for a while now! Love the tips on how long to keep your makeup for. I feel really lucky that I don’t suffer from allergies! I do suffer from keeping my makeup too long though! Passing these tips on to others that I know that suffer from allergies!! Love these tips! I absolutely love the idea of adding aloe vera to foundation to keep face hydrated and avoid puffiness. Totally brilliant! I didn’t know there were throw out dates of 2-3 months on some makeup! That means that I need to get me some new makeup! 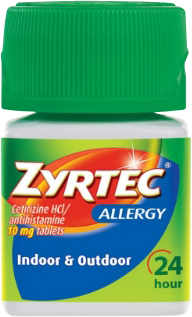 Uggg, I hate allergies, but Zyrtec is our go to allergy medicine in our household. My husband suffers from bad allergies! We have not tried Zyrtec though, I will next time I am at the store.